I decided to take a trip north from downtown today via the #358. 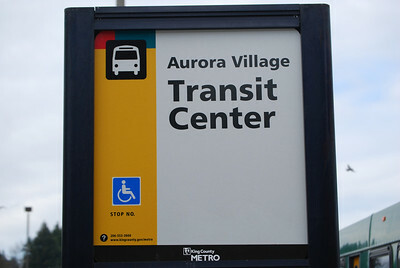 I then determined I could get some lunch around the Aurora Transit Center. 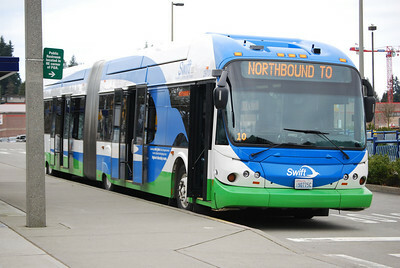 After that I’d board one of the SWIFT BRT Buses to check out how legit the BRT Service is to Everett. 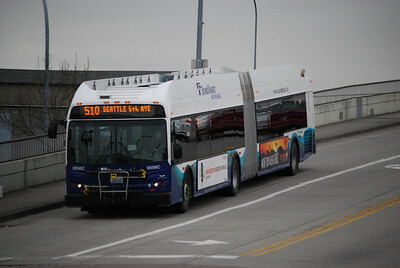 Once there I wasn’t sure what I’d do exactly, but figured I’d jump on the Sound Transit #510 Express back to downtown. Well, most of that plan went down without a hitch, however a bit got added on to it. I checked the ETA of the #358 arrival with the Android OneBusAway App written by Paul Watts via my HTC Evo (This is an amazing phone btw, if you’re in the market for a phone). 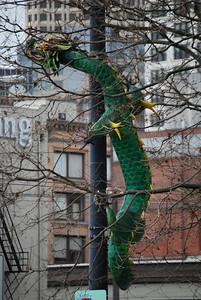 At about ten minutes before the estimated arrival I walked out and crossed the streets of Denny and Aurora. It can usually take about 6-8 minutes because of the all the lights and cross walk nonsense at this intersection. 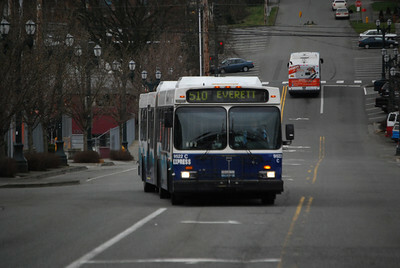 I boarded the #358 at 11:03am headed north at Denny and Aurora (Hwy 99). The bus took no time to clear the lights there and merge onto Aurora (99). 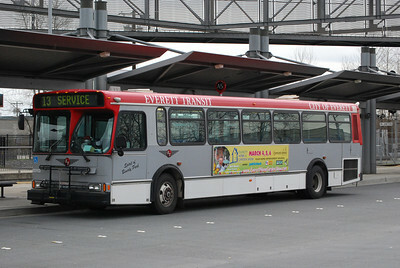 The #358 Route travels north from the International District (i.e. Chinatown) all the way up Aurora Avenue (Hwy 99) to the Aurora Village Shopping Center, where the Aurora Transit Center is. The ride is an ok one, even though the scenery for the majority of the trip is just sprawlling highway retail and light industrial with residential shoved in here and there. Away from the highway no more than a block though everything is residential, light and medium. Mostly it is single occupancy housing. However in almost every direction it is unfortunately trashy looking. The highway itself is just beat up and the storefronts along the highway look almost 3rd worldish. I can’t really say I was surprised since most of America actually looks this way and more is beginning to. The middle class only has more of this to look forward to. With sprawl at the intensity it is built out in the United States the more drain it will have on the middle class, pushing them either farther down into poverty or locking them into the mediocrity of it all. 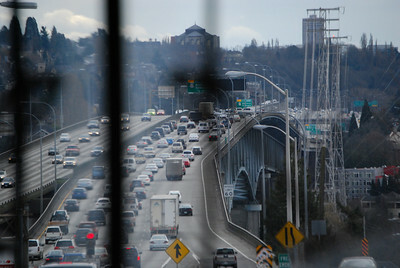 The one hold out along the entire route is the Aurora Bridge across the waterway. The view is striking in every direction. When coming back into the city this way you can see the skyscrapers downtown peaking out of the hills. The rest of the trip really isn’t advised, unless you’re just up for exploring as I was today. I made it to Aurora Village and had a cheese steak at Jersey Mike’s. 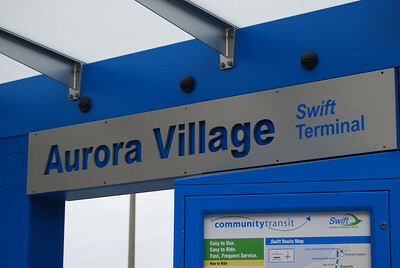 After that I walked the couple hundred feet back to the Aurora Village Transit Center and boarded one of the SWIFT BRT Buses toward Everett. I noted a few specific things about the BRT Service. The route map covers 17 miles, so it isn’t a short route. When boarding, but before departure the first thing I noticed was the massive space consumed for the bike racks. 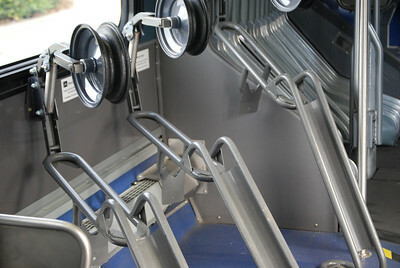 There are three racks inside the bus. Only bikes can go on these, one can’t stand in the space or sit as they’re positioned in an awkward way. The second thing I noticed was a minimal amount of seating. Compared to most of the 60′ buses there is almost 2x as much seating as on these BRT buses. I do understand though, these buses aren’t really oriented toward sitting, but instead they’re designed to quickly board and hustle you to your next stop. But this is the US, we’ve strewn everything all over the place, sprawling from one shoreline to the other. NOTHING is really close together in this country except in a few select cities and in a few select areas of those cities. We have built this nation from a position of logistical idiocy – which makes the fact that there are no seats for a 17 mile trip, that takes about 30 minutes, rather odd. Add to that an obesity rate for more than half the population, and you’re bound to have some poor fat person standing up, struggling not to fall over after a short period of time. But then again, I guess that’s why transit riders are often 2-3x more likely to be in good shape than automobile users. Anyway, I thought it odd that they have so few seats. 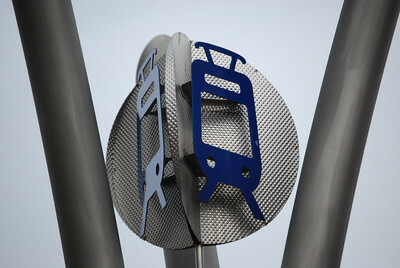 A better solution, than this type of bicycle rack would be to use hanging racks like on the light rail in Portland. Hanging bikes is a much better option than occupying space that otherwise people could use when there isn’t a bike. The other thing I noticed was the odd configuration of the handicap area – which again consumes what would normally be about 6-8 seats or more – but I digress, I’m fully supportive of handicap access. The entry and exit onto the vehicle was extremely smooth. As one would expect, by paying before you board it makes getting on and off much quicker. To make this even easier there are three large doors on the bus. Overall the ride was very smooth. 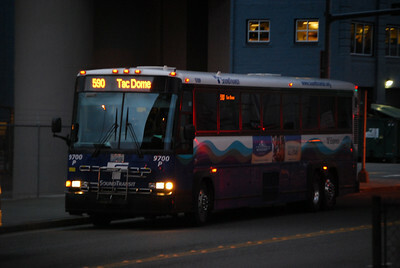 Much better than the poor old beat up buses King County Metro uses for the #358 route. 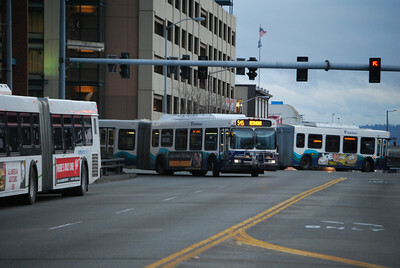 Of course, these are really new buses. Considering the not so great condition of a lot of the route these buses will most likely be just as clunky in 10-15 years. On a somewhat less important note, I also observed that the SWIFT branding was really nice. 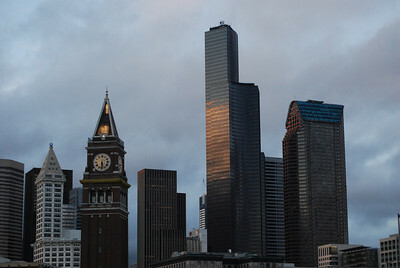 Especially compared to the dark and humdrum color schemes of King County Metro. 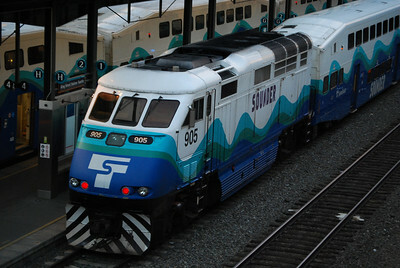 Their colors are rather depressing, but the SWIFT branding was lively and clean. On that same theme Community Transit appears to be doing a great job keeping these vehicles clean, as the bus was spotless when I rode. Last but not least, this route being about as long as the #358 route, took about 2/3 as long. I think it was about 30 minutes for the 17 mile trip, which by any measurement is really quick along a 45 mph mixed corridor roadway. After the arrival on the SWIFT in Everett I didn’t stay around long, possibly a total of 9 minutes before a #510 south bound arrived. I boarded immediately and off to Seattle I went. The trip wasn’t too exciting, a little traffic close to the I-5 Biridge, but all else was calm and tranquil. The overall trip on the #510 is smoother than the #358 or SWIFT, the express bus moving along at 50-60 mph on Interstate makes for a much smoother ride than the old Aurora 99 Highway. I arrived back downtown and did some work at Zeitgeist Coffee. When done with the work I up and footed it around the area a bit and caught a lot of photographs. Here are a few of the better ones. Fewer seats = better circulation. Better circulation = less time at stations, and you know how it goes from there. Because this is a bus, I don’t think there’s enough room to maneuver a bike into a vertical position. I haven’t checked, but I imagine the front wheel would hit the top of the doorway if you tried wheeling your bike in “Portland style”. Another thing to note is that Swift stops at all stations all the time. Haven’t been up there since opening day, but they still had the “stop requested” signage and eyelets for the pull cords. A rep said they were going to be disabling those (apparently they don’t have a switch on the dash like Metro does). I don’t understand why they ordered the vehicles with that equipment if they’re not going to use it. 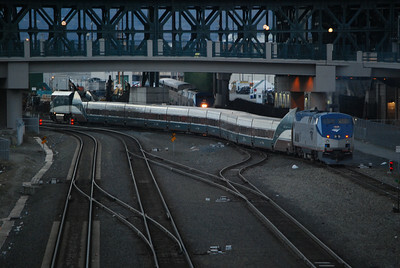 I guess it’d be easier if they ever had to convert those vehicles to run in regular service in the future. 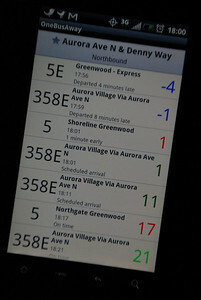 And Metro doesn’t assign specific buses to routes–rather it assigns *types* of equipment. On the 358, it is almost always high floor articulated buses. It is very likely that a bus used for a few hours on the 358 in the morning would end up serving commuters on route 312 in the evening.